While every season is filled with romance, fall may quite possibly be the most romantic. The crisp autumn air and the brilliant colors on display just make everything feel a little more magical. It doesn’t hurt that the most common fall activities are pretty romantic as well! From roasting marshmallows to stargazing to romantic scenic walks – there’s a whole host of activities for couples to do this time of year. To help you make the most of the fall season, we’ve come up with these forty ideas to add to your romantic fall bucket list! 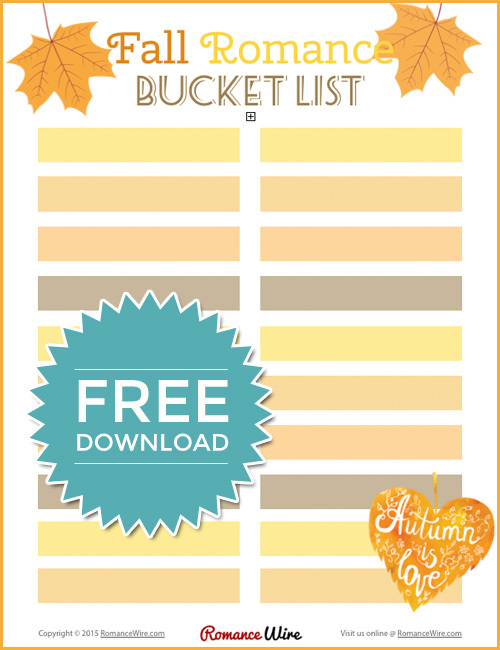 Even better, we’ve also created a Fall Romance Bucket List Printable to help you keep track of your progress. Drink apple cider or another apple flavored beverage. Take a scenic fall drive. Tailgate or host a football party. Attend a fall festival or fair. Cuddle up in warm blankets together. Complete a fall themed puzzle together. Go on a bookstore date. Try a fall themed coffee together. Go beer or wine tasting. Work on a house project together. Play in a leaf pile. Paint a pumpkin or leaves. Start a couples gratitude journal. Complete a fall bucket list!